In the midst of the worst Padres season EVAR, I was driving home from work, actively avoiding the Scott and BR misogyny spectacular and the Steve Hartman rambling on about old, tired, decrepit Raiders and Lakers stories show, when I remembered that Padres Social Hour was simulcast on 1700 AM. Padres nirvana, especially at this time of year when local sports talk would rather blather about no pads Chargers practices than the local Major League team. For all of the criticism of Wayne Partello’s Barnum and Bailey Circus promotions strategy I’ve levied, the creation and production of Padres Social Hour can be hailed as nothing other than an incredible success. To have a full hour of original, insightful content produced on a daily basis for Padres fans has been so appreciated. When I get home from work, I now have the option of flipping on FSSD and catching the Social Hour. If I’m driving, it’s simulcast on the radio. For a Padres nut like me, the more original Padres content I can find and consume, the better. Jesse Agler has been great as host, skillfully guiding interviews, mixing in social media feedback he’s receiving on the omnipresent laptop in front of him, and lobbing up questions to that day’s cohost. Randy Jones, Bill Center and Kurt Bevacqua have been fine as cohosts, although I’d love to see the show diversify this cohost. There are enough media personalities, bloggers, fans, etc. that would make interesting cohosts. It’d be nice to see a little youth injected into the formula, especially with it being a “Social Hour” centered on social media, I think Jones, Center and Bevacqua are more appealing to an older demographic. The Padres Social Hour has had a few, huge events. The one that comes to mind first is the TV simulcast of the Fowler/Dee teleconference with season ticketholders that spawned a contentious battle regarding a comment made by Mike Dee about Huston Street staying with the team. The other is the bringing on of Wayne Partello after the big Bring Back the Brown weekend this season to discuss a uniform change. These two examples show that management buys into the usefulness of reaching fans through the show, but it also shows that the Padres Social Hour provides a comfortable and safe environment for team executives to face the public. While I love Jesse Agler’s work as host, I always remember that he is a paid, Padres employee that works for Partello and Dee. I’ve thrown the word “shill” around before, but Jesse Agler is, by definition, a paid shill for the team. And in the end, Padres Social Hour is a team-produced and paid for outlet for the Padres’ public relations wing. Not that that can’t be enjoyable entertainment [it is], just that some comments need to be taken with a grain of salt. This was shown with Agler’s vehement defense of Dee’s [his boss] Huston Street comments, which I think most people would agree were technically accurate in a legal sense, but crafted in a misleading and confusing manner. 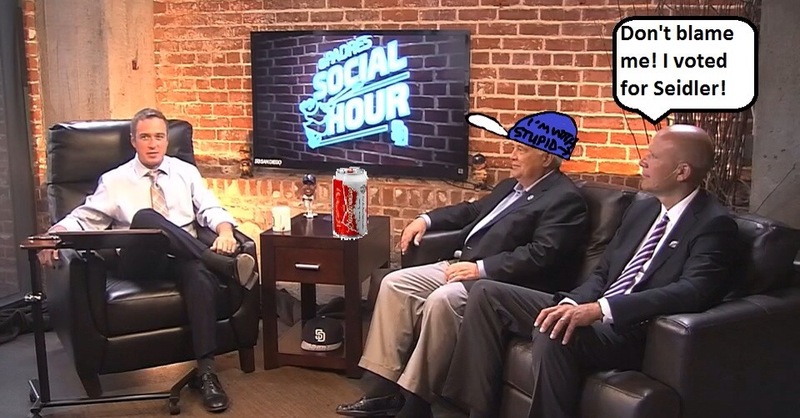 I’d never expect Padres Social Hour to address or focus attention on issues like the Beergate months long hoodwinking of fans as that really has no potential for positive PR for the team. I am very hopeful that the team keeps the Social Hour around. I’m not sure any fan can complain about an hour more of Padres content per day. And you’ve got to give Agler and his crew kudos for showing up to the studio on east coast day games for an 8:30 AM taping. It’s like finding a $20 bill in my pocket after doing laundry when I get to work and realize that there’s a Padres Social Hour on right then. In the midst of a disastrous season, I’m hoping team executives can recognize the few successes like the Padres Social Hour and stay the course in future seasons.